Anchorites were ascetic monks who lived in alone or in small groups in enclosures attached to churches, never emerging. Anchoresses were women who sealed themselves away, their funerals being celebrated upon their enclosure, signifying their death to the world. In the 13th century, increasing numbers of religious men and women were seeking a personal and total devotion. As did all monks and nuns, anchorites followed rules governing daily activities and subordinating individual will to that of the community and God. The Ancrene Riwle (Anchoress' Rule) was originally written for three young noblewomen, probably in north Worcestershire, who were embarking on this religious exile from the world. About 1300 Matilda de Clare, the Countess of Gloucester, gave the book to the Augustinian canonesses at Canonsleigh, Devon. 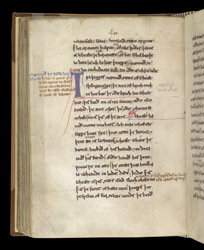 A section of the Rule begins on this page, with the large, blue letter 'T'. Near the end of the page, the Old Testament story of Judith and Holofernes is referred to. Judith was a Jewish heroine who saved her people from the invading despot Holofernes by "hacking off his head," as the text says on the next page. Such references in monastic rules had been extremely unusual. The Ancresses' Rule is different in its use of anecdotes and parables because it intends to engage the reader in a personal way. Not written for a community, it is about individual daily devotion.